The bags provide excellent protection with a combination of 20mm high density foam padding and a tough water-resistant non-PVC backed material. Added features such as soft rubber handles, zip pulls and a robust molded base provide the perfect solution to carry your instrument safely, wherever you may need to go. The Urban Series is only available in the color black and has commuter-friendly reflective print, a valuable safety feature if you are a cyclist or pedestrian. At the rear of the bag is a compartment where the backpack straps can be stored out of sight if carried by hand. 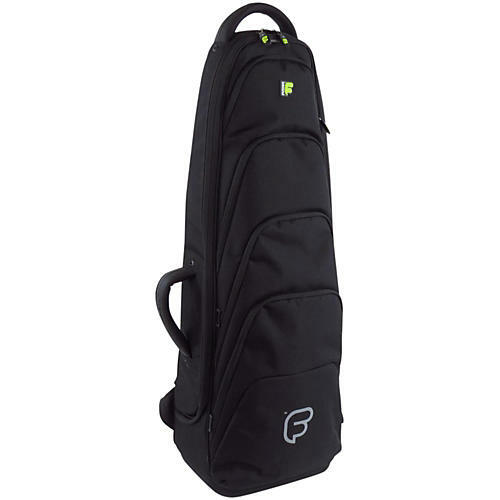 There are lockable zips on the main compartment of the bag to keep your instrument secure. The largest of the exterior pockets holds a removable rigid slide pouch giving your instrument and slide ultimate protection while being carried to gigs or rehearsal. This bag holds a Tenor Trombone with a bell size of up to 9.5". Your Trombone will be stored safely inside a 20mm (0.78) high density lightweight foam shell, the inside of which is made from a soft non-scratch velvet-mix lining.